I admit to a bias - I have a story in this anthology and had the opportunity to read all the stories pre-publication. That said, I think there is a lot to like in this book. There are short stories in many genres including literary, sci-fi, fantasy, horror. Some are romantic. Some are tragic. Some are just a rolicking good read. If you're looking for some excellent short fiction to read as you relax by the pool this summer, you can't go wrong with this one. An author's update:After buying several copies as soon as it was available, I've read every story in this anthology, many of them more than once. I have to say that every story in it offered a very imaginative and very different take on the unifying theme; and there wasn't what I'd consider an undeserving tale in the book. It surpassed my expectations, and presented me with a number of authors whose works I very much want to read, and whose writing careers I will follow.My own story, "Crazy Uncle", was taken from a memoir of similar tales entitled "30,000 Leagues Undersea: True Tales of a Submariner and Deep Submergence Pilot" now under review for publication. I chose it as a fun and fitting tale, and am thrilled it was chosen for inclusion in this showcase for emerging authors. But as it is a true story in a collection of fictional tales, I found myself wondering if mine wasn't better described as "the Creation of Adventure".No matter; that's an author's introspective quibble. All in all, "The Adventure of Creation" anthologyis a damn good read and my 5 stars stands. I'm very proud to have a story in it. I hope you agree. The Adventure of creation is one of the few anthologies I have read.The stories belong to a wide spectrum of genres from fantasy to science fiction to real world.And the stories are very different form each other there are stories laced with humor as well stories with dark undertone.The stories are fresh and are neatly created but I felt some stories lack detail and depth in narration.I will list some of my favorite stories from the anthology.After the fire:The story follows the interaction between a girl and a fallen angel in a world torn by war between humans and the fallen angels.My soul to take:A reluctant Magi tries to save the world from casting from dreamworld.The story is laced with humor and has makings of a future novel.Definition of superhero:When a bank is robbed by super villains a bookstore owner becomes super hero to save the day.I liked the writing style of the story very much. I was sent this anthology published by the Independent Bookworm in exchange for my honest review. It is an anthology of stories from the students of writing teacher Holly Lisle who writes a forward to the anthology and also chose first, second and third place stories. Holly’s first placed story starts the anthology, the second story is the one that received third place and the second places story ends the anthology. One story received an Honorary Mention.In total there are 35 stories with a theme of The Adventure of Creation, as you can imagine a wide variety of genres is contained in these short stories, some are darker than others, some are lighter and some are very short, fantasy, mythical, magical but nothing is too graphic that it will put you off and stop you reading.As with anything all reading is subjective and I enjoyed reading all of the stories although five of them weren’t really to my individual taste. 13 stories I really enjoyed reading, 15 stories I thought were fantastic and left me feeling emotional at times and wanting to read further.Two of the stories I thought were outstanding, including the Honorary Mention story.All in all a great anthology that leaves the reader wanting longer stories from these super talented writers. Well done to all contributors. 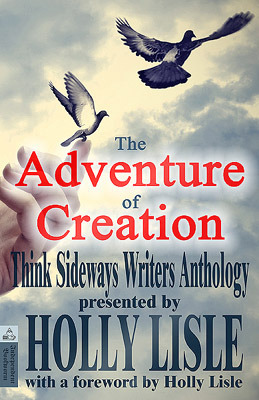 Taking you on a wild romp through the imagination, The Adventure of Creation features 35 short stories written by students of Holly Lisle's How To Think Sideways course. Whilst every story is centred around the theme of creation, there's no one specific genre being featured. Fantasy worlds, magical kingdoms and fairy tales nestle side by side with science fiction, realism and slice-of-life pieces. Love stories and tragedies make you tear up even whilst others tell of things that make you cringe. The stories in the anthology are so good that there's only one which I didn't really quite like (I'm not telling which). I think my favourite would be the one which won second place (and ends the anthology) - The Definition of a Super Hero. Other stories that I especially liked (in no particular order) are: A Splash of Art, The Forest King, Tortellini, Restoration, Spoilers, After the Fire and Hedda of the Upworld. (In which you can tell my reading bias. Oh well)I'd recommend this for: 1) anyone looking for quick, great reads2) people who want to try out new genres but don't want a whole novel3) parents who want their kids to start reading something, anything, just readI received this review copy from Independent Bookworm in exchange for an honest review. As with all anthologies, there were stories I liked and stories I didn't like. There were even a couple that I recognized were well-written, but just didn't click for me.Overall, I want to note a couple issues - one, the stories seemed to be arranged fairly randomly. I would have liked to see a little more flow between them, particularly as they were all different genres. And second, the stories had a very short wordcount limit, which some of them struggled with.There were too many stories to review in detail, but I'd like to acknowledge two in particular:First My Soul to Take, by Amanda Tompkins, which was quite a lot of fun and would fit perfectly on an urban fantasy shelf in your local bookstore (seriously, I'd read a whole novel like that)And Second The Definition of a Superhero, by Taven Moore, which is in my opinion the highlight of the collection. Despite the limited wordcount the author managed to pack in a hell of a lot of story, and characterization and worldbuilding to boot. Well done! I loved these stories. First of all, short stories fit into a busy schedule. I can read one when I'm waiting for something, then put the book down and come back later when I have the time. Secondly, the stories are all awesome and come in so many genre's there's sure to be one that is your favorite. If you're looking for a little escape from the everyday, pick up this book. You'll be glad you did. All these stories were well written and enjoyable. This is great for reading sitting in a doctors office waiting or wherever or short read at night or to take on a trip laying by the pool. This was by far one of the best short story anthologies I have read. Holly Lisle Amanda Tompkins Amy Padgett Connie Cockrell Debbie Mumford Debbie Zubrick E.L. Blackburn F.M. Boughan - Holly Lisle has been writing fiction professionally since 1991, when she sold FIRE IN THE MIST, the novel that won her the Compton Crook Award for best first novel. She has to date published more than thirty novels and several comprehensive writing courses. She has just published WARPAINT, the second stand-alone novel in her Cadence Drake series.Holly had an ideal childhood for a writer…which is to say, it was filled with foreign countries and exotic terrains, alien cultures, new languages, the occasional earthquake, flood, or civil war, and one story about a bear, which follows:“So. Back when I was ten years old, my father and I had finished hunting ducks for our dinner and were walking across the tundra in Alaska toward the spot on the river where we’d tied our boat. We had a couple miles to go by boat to get back to the Moravian Children’s Home, where we lived.“My father was carrying the big bag of decoys and the shotgun; I was carrying the small bag of ducks.“It was getting dark, we could hear the thud, thud, thud of the generator across the tundra, and suddenly he stopped, pointed down to a pie-pan sized indentation in the tundra that was rapidly filling with water, and said, in a calm and steady voice, “That’s a bear footprint. From the size of it, it’s a grizzly. The fact that the track is filling with water right now means the bear’s still around.”“Which got my attention, but not as much as what he said next.” ‘I don’t have the gun with me that will kill a bear,’ he told me. ‘I just have the one that will make him angry. So if we see the bear, I’m going to shoot him so he’ll attack me. I want you to run to the river, follow it to the boat, get the boat back home, and tell everyone what happened.’“The rest of our walk was very quiet. He was, I’m sure, listening for the bear. I was doing my damnedest to make sure that I remembered where the boat was, how to get to it, how to start the pull-cord engine, and how to drive it back home, because I did not want to let him down.“We were not eaten by a bear that night…but neither is that walk back from our hunt for supper a part of my life I’ll ever forget.“I keep that story in mind as I write. If what I’m putting on paper isn’t at least as memorable as having a grizzly stalking my father and me across the tundra while I was carrying a bag of delicious-smelling ducks, it doesn’t make my cut.”You can find Holly on her personal site:HollylisleYou can find Cadence Drake, Holly's currently in-progress series, on her site:CadenceDrakeYou can find Holly's books, courses, writing workshops, and so on here:The HowToThinkSideways Shop, as well as on , Barnes and Noble, and in a number of bookstores in the US and around the world.